When you have decided you need some website work done, you can find yourself several possible situations. A new website may be hosted under your own domain name by your chosen hosting service, or on your institute's server; an existing website will probably continue under the present arrangement. Hosting by your institute typically comes with strings attached: If you have to use their Content Management System (CMS) then the layout, appearance, and possible features are outside of my control (but on the plus side, all structure is already in place — what remains to be done is checking out the possibilities, then structuring and editing your content); if you do not get access to their CMS, then you usually cannot host scripts neither, restricting your possible functionality (but images, downloads and feedback forms wouldn't be a problem). If you still need to decide on a hosting service and domain name, Centimedia will of course assist you. After the website is delivered to your satisfaction, you can choose to maintain it yourself, let Centimedia continue to update it, or go for a middle way where you do some of the updates but ask for a periodic cleanup and/or addition of new features as needed. For various reasons you may want to have a personal website unconnected to your institute: maybe to maintain a continuous online presence if you will have fixed-term postings for the foreseeable future, or to host information for an informal network, or to have more control over layout and updates. 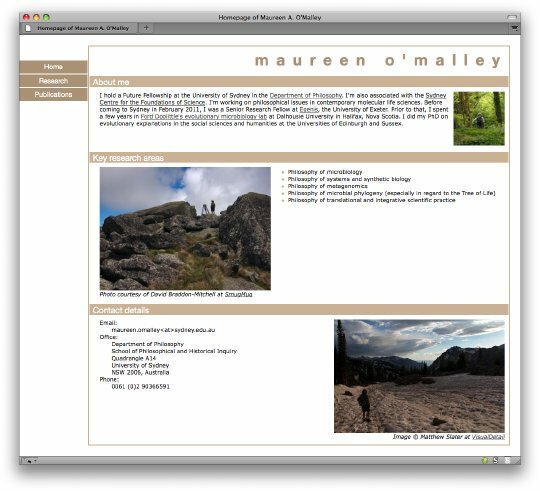 A representative example of a researcher's site is http://maureenomalley.org, divided into three parts: the home page containing key personal information, a detailed research page, and a list of publications. 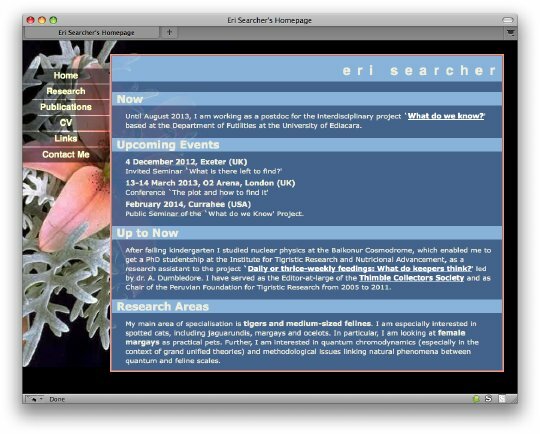 For scientists in temporary jobs, another practical arrangement is shown here, where the home page serves essentially as event notification, followed again by research and publications pages, plus CV and networking links pages, and Contact details. From Centimedia you will receive a very readable and standards-compliant HTML website, with all design elements carefully separated from the content in the CSS layout file. This means that you can choose to get your content online as fast as possible while making design choices only later, or you can refresh the layout later without disruption nor inconsistencies from forgotten layout elements. It also means that even a novice can decide to update and maintain their finished website, possibly with occasional requests for code cleanup or introduction of new elements. If you want several people to update the content of a website, you need to ensure all have different logins (and possibly different levels of access: all can add and edit content, but few can publish/activate these changes or delete pages), as well as automatic backups. Such a setup requires a Content Management System (CMS), of which there are many both free and paid: popular free ones are for example Drupal, Joomla!, and WordPress; many UK universities buy the hosted services of TerminalFour, who often also design their sites. An advantage to using a CMS-based site is that content is dynamically generated. This means a blog can be included without problems, content can be timed so that it gets published and removed or prominently featured at predetermined times, slideshows are easy to embed, and multilingual sites can be maintained with relative ease. Centimedia has designed and arranged hosting for such dynamic sites, e.g. 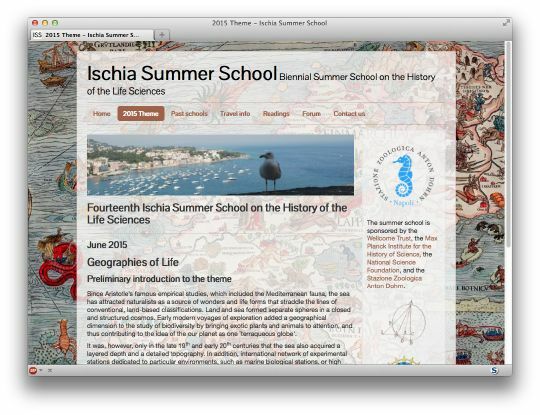 the website of Ischia Summer School for the History of Science, which includes a discussion forum and distributes reading materials to its registered users. But it is also possible to work within the parameters set by your institute's setup, and edit content on an existing site. I have edited content for example for the ESRC Genomics Network and the Exeter University department of Sociology and Philosophy (indeed both TerminalFour-based), adding categories and items as well as editing existing content. In such a situation, however, I have no control over the layout and what type of features (blogs, slideshows) are possible. Another example of a Joomla! CMS based website designed and maintained by Centimedia is LucaLeonelli.org. This non-academic website features bilingual Italian-English content, and the results of many hours of image editing. Whatever the chosen setup, Centimedia can either keep maintaining and updating the content of your site based on your input, or can teach you how to do it yourself. Also attractive is a middle way, where you do the small content updates but Centimedia periodically edits the HTML code for readability and consistency, and adds new features you want. A simple example of such a feature request was to give a clear distinction between original publications and reprints, for which I proposed and implemented a simple icon. You have to also choose in what form and how precisely edited you want to send your content, initially and later on. You can opt to give it precisely edited and formatted in e.g. a PDF or Word document; you can mail edited content as flat text without layout, indicating required markup like bold or italic part; or you can even send rough material to be fleshed out by me. The third option demands a level of trust in my writing and editing skills, but can greatly help you to get your content online at a moment when you need all your time. For example, should you receive a project grant during your conference or fieldwork season, you will want it advertised online and mailed to your contacts as soon as possible; then I can collate your grant proposal's description with your homepage's biographical info and other sources to give you a site of whatever length and detail you desire.